Experience Atlanta in an inspirational new way, and enjoy the benefits of effortless hotel travel at Sheraton Atlanta Hotel. 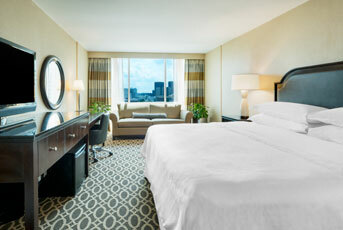 Southern charm and modern style blend impeccably in our expansive, completely renovated Atlanta hotel rooms and suites. Ideal for both business and leisure travelers, offering guests the perfect downtown Atlanta experience. The Sheraton Atlanta will never reach out to attendees to solicit booking rooms. Please only make your reservations using the information below. The group room rate is $175 + tax (based on availability). This rate expires on Friday, February 1 at 5:00pm EST. Please use the reservation link provided in your registration confirmation email or call 404-659-6500 and identify yourself as a MenuDirections attendee to receive the group rate. All reservations must be guaranteed with a deposit of one night's room and tax. To avoid cancellation charges, reservations should be cancelled three days prior to arrival date. For information on restaurants in Atlanta, click here. 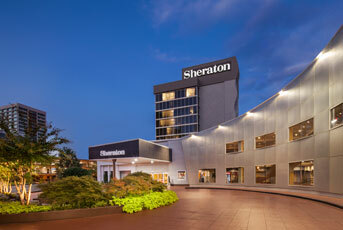 Sheraton Atlanta offers several one-of-a-kind restaurants in Atlanta, click here to view hotel dining options. Located in the center of Sheraton Atlanta, Collage is a casual breakfast and lunch restaurant offering buffet style food as well as delicious a la carte menus. The elegant yet relaxed Fandangles Restaurant & Bar, overlooking the pool and gracious garden courtyard through floor-to-ceiling windows, offers a health-conscious "Southern Evolution" menu with distinct regional and local flavors. Head to the third floor of the hotel for a dining experience that can't be beat! The Deli is a casual eatery with dining tables and an outdoor seating area. Pick up your coffee and a breakfast sandwich in the mornings, and light bites throughout the day with plenty of lunch and dinner options as well.